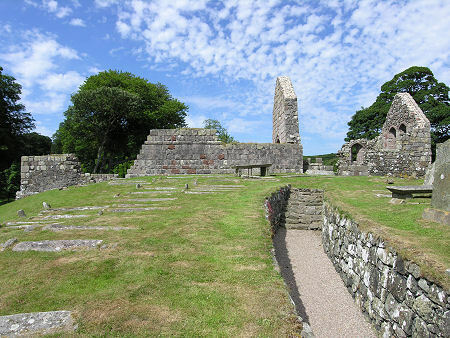 The surprisingly extensive ruins of St Blane's Church lie close to the southern tip of the Isle of Bute. Built in a sheltered hollow near the top of a south facing slope, its site comes complete with beautiful views south to the Isle of Arran and its outlier, Holy Island. Leave your car in the parking area at the end of the public road, two miles south of Kingarth, and walk up the well signposted and beautifully grassy track towards the trees on the skyline to the north east. 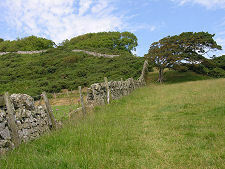 The hillside opens out into a broad bowl, and above this is a flat area bounded by tree-topped low cliffs to your left and sheltered from the north and east by rising ground. Here you find the church and its walled enclosures. Most of the remains you see today, of the nave and part of the chancel, date back to the 1100s. In the 1300s the chancel was increased in size, so its east end, less well constructed than the rest of the church, dates back to then. 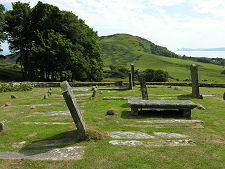 The upper and lower churchyards come complete with a large selection of fairly worn grave slabs. 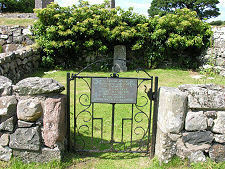 Men would have been buried in the upper churchyard, and women in the lower churchyard. One or two of the slabs still show traces of having been highly decorated at one time. 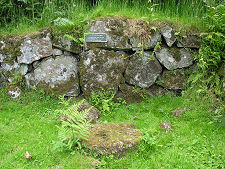 The low remains of another building in the lower churchyard are thought to have been of a small chapel. 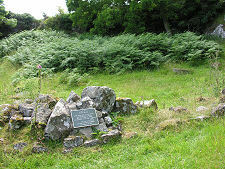 To the west of the church and churchyards, close to the base of the low cliffs, you can still see the well that once served the community that lived here and fragments of dark age stonework, while not far away are the overgrown foundations of a manse, in use until 1587. The first Christian settlement on this site took place as early as the end of the 500s when St Catan established a monastery here. 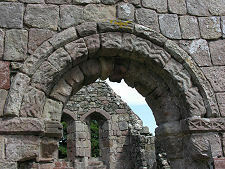 He was succeeded as Abbot of the monastery and bishop of the area by his nephew, who later went on to become St Blane. 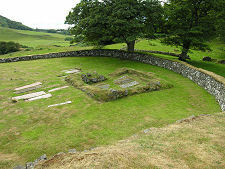 St Blane is perhaps better remembered for lending his name to Dunblane, which he later established: but it was on Bute that he started his religious work. 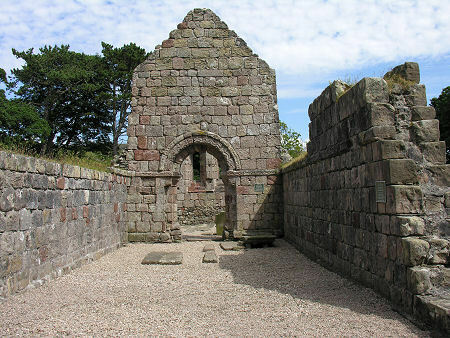 The monastery existed peacefully until the late 700s, when the sudden deaths of two abbots, in 776 and 790, are thought to have been the result of Viking raids. 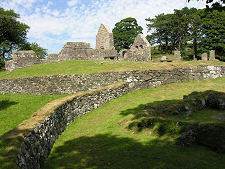 Bute became part of the Norse empire and it seems likely that the monastery was abandoned some time around the year 800. Little remains of the original monastery except, possibly, the shape of the upper churchyard, whose wall probably follows the line of the wall encircling St Blane's original abbey church. With a little imagination it is also possible to trace the fragmentary remains of buildings near the foot of the cliff, near the well, that might have provided accommodation for monks in this original monastery. In time the Norse settlers turned to Christianity, and in time Scotland regained Bute. 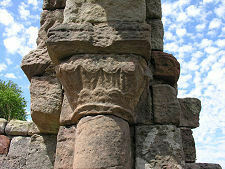 In the 1200s St Blane's Church was constructed as the parish church serving the whole of the Isle of Bute. 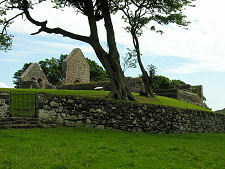 From the 1300s the island parish was divided with the construction of St Mary's Church in Rothesay. 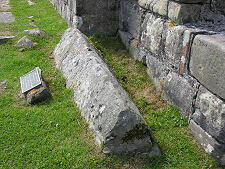 The continuing Norse influence is reflected in the hogback tombstone found just to the south of the chancel. This is often - wrongly - said to mark the tomb of St Blane. After the Reformation in 1560 the parish priest, Sir James McWararty, refused to embrace the Protestant faith, and he also refused to relinquish his occupation of St Blane's. He was still living in the nearby manse in 1587, and it seems that the response of the authorities was simply to leave the church to fall into disuse rather than tackle Sir James directly. What you see today, give or take some excellent consolidation and preservation work by Historic Environment Scotland, is pretty much the church as it was at the end of the 1500s. Open all year and admisson is free. 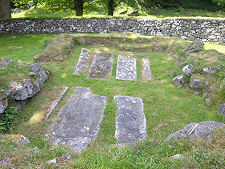 Part of St Blane's Monastery?